They crawl, they fly and some even swim. Weevils are one of the largest families of insects in North America with an estimated 2700 species, all eating machines that come in a variety of sizes, colors and shapes. Join us as we explore the diverse and daring world of weevils. "From opening scenes to the ending, a viewer will enjoy the study of weevils...Introductory science or biology classes, as well as advanced study groups in entomology, botany, and zoology, could benefit from seeing this video. 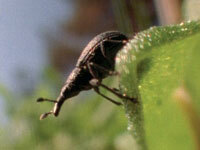 Anyone interested in our planet might want to learn about weevils and their roles."